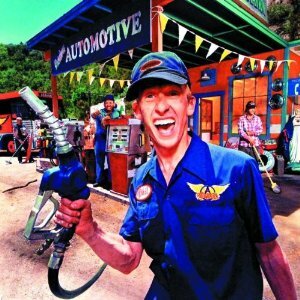 A Little South Of Sanity is a live album by Aerosmith capturing their sound in the 90s on the Get A Grip and Nine Lives tours. This is a very good summary of the second coming of Aerosmith in the late eighties and early nineties with Permanent Vacation, Pump and Get A Grip combined with a few oldies from their seventies career. I haven’t seen this live album by Aerosmith appear in any of the best live albums lists although Live Bootleg does feature. Do you think this is the best of the live albums by Aerosmith? Please vote in my Aerosmith best live albums poll. What is The Best Hard Rock Live Album? Should this album rank towards the top in my readers poll to find out the best hard rock and heavy metal live albums? This entry was posted in 1990s Live Albums, Classic Rock Live Albums, Heavy Metal Live Albums and tagged 1990s classic rock, 1990s hard rock, Aerosmith Live Albums, links needed by Paul Simister. Bookmark the permalink. It’s not as good as Live Bootleg for me. It sounds a bit flat compared to the ragged inspiration of the earlier album. Thanks for your comment. I was disappointed in Live Bootleg but then I didn’t like the multi venue, multi year approach to compiling an album that could easily come from a single concert. I haven’t been in a hard rock mood recently to seriously listen to the radio broadcasts that are appearing and don’t yet have a go to live album. Instead I play Toys In The Attic or Rocks if I’m in the mood for some Aerosmith. Rocks represents their peak for me. A world away from the trite pop they churn out now. There are some good early live shows from 1973 on YouTube. The band sounds tight and professional and there is a hunger in the performances too.